If you hang out in the Denver airport waiting for a plane to take you back to Nashville, you’ll see some things that make you smile. A guitar case or two. Cowboy boots. An orange ball cap with a big white T on it. But the biggest thing you’re likely to notice is folks using a word you haven’t heard since you got to Colorado. It just comes easy to folks from our part of the world, who know there’s no substitute for it. Now, it would seem, the rest of the country is trying to jump on the “y’all” bandwagon. Why? 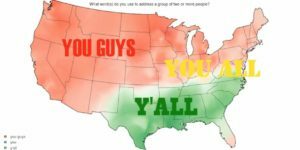 Because the search is on for a gender-neutral alternative to the term “you guys.” Those who have studied grammar even a little bit know that American English has no standard second-person plural pronoun. There’s “we” and “us” for first-person and “they” and “them” for third-person, but “you” is “you” whether you’re one person or a room full of people. No wonder they want to steal “Hey, y’all” from us. But here’s the problem. People who aren’t from the South can’t pronounce the word “y’all” as it’s meant to be pronounced. Some are determined to make two syllables of it, by saying “you all” really, really fast. (As a side note, they often don’t know how to spell it, either. The most common error is “ya’ll,” which ignores the fact that—because the word is a contraction–the apostrophe takes the place of the letters o and u and should therefore go after the y.) Or they don’t realize that y’all rhymes exactly with ball, call, fall, etc. But wait. Maybe they can’t make it rhyme because they don’t know how to pronounce ball, call, fall, etc. When I lived in New Jersey, a boy in my third grade class asked if I wanted to “play boil” at recess. At least that’s what it sounded like to me. I wasn’t so sure if I should say yes. Did the game have anything to do with putting eggs or corn-on-the-cob in scalding water, I wondered. As it turned out, of course, it involved a red rubber playground ball and an asphalt pad. Chances are that same boy would say “Hey, yoil,” if forced to give up “you guys.” Maybe gender neutrality just isn’t worth it.